The ECB's Survey of Professional Forecasters supports the ECB’s view that inflation in the Eurozone will pick up and will be back within the central bank's target range in 2019. This column disagrees. 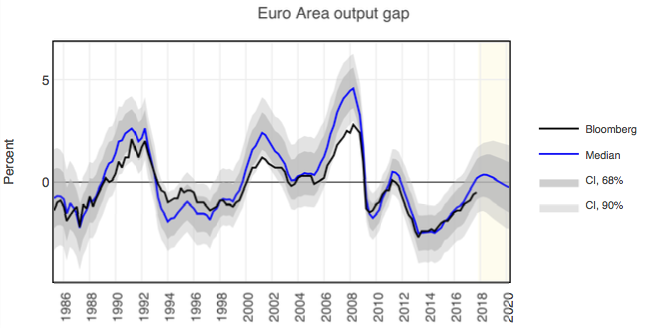 Using a model that formalises the widely held view that inflation dynamics are a function of three components – long-term expectations, the Phillips curve, and oil price movement – it forecasts Eurozone inflation in 2019 at only 1.1%, a rate which is close to that implied by the bond markets. It is a widely held view in policymaking (e.g. Yellen 2016) that three components matter in inflation dynamics: a slow-moving trend reflecting long-term expectations, the Phillips curve connecting real and nominal variables, and the impact of oil price fluctuations on expectations and prices. In a recent paper (Hasenzagl et al. 2018), we propose a model that formalises this view. 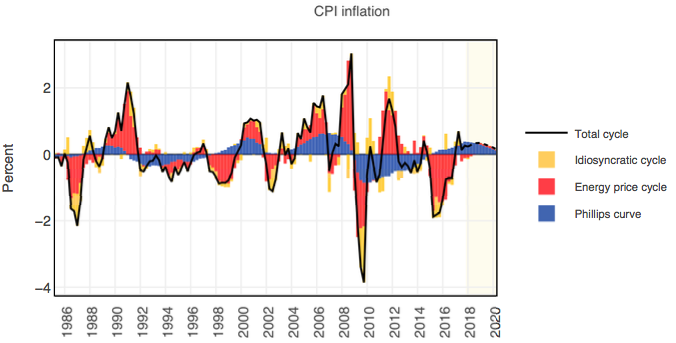 Our model, applied to US inflation, finds that the Phillips curve is well identified and stable, but often dominated by oil price-driven cyclical fluctuations which co-move with inflation expectations. Contrary to the standard rational expectations model of the Phillips curve, this ‘oil cycle’ does not affect the output gap and is transmitted to prices as a purely expectational component. In this column, we report key results for Eurozone inflation based on the same model and compare them with what we obtained for the US. 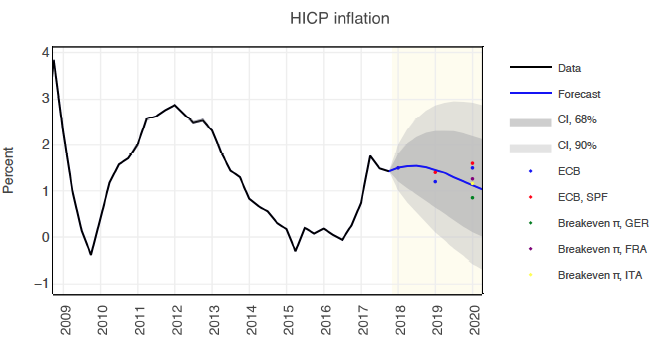 We then use the model to forecast HICP inflation in the Eurozone for a horizon of up to two years and decompose the forecast into the three components – trend expectations, the Phillips curve, and the effect of oil price changes – in order to evaluate the likelihood of returning to target in the next two years. Figures 1 and 2 report inflation data together with trend inflation, which we identify as a common long-term component of inflation and inflation expectations. The difference between the two economies is quite pronounced. 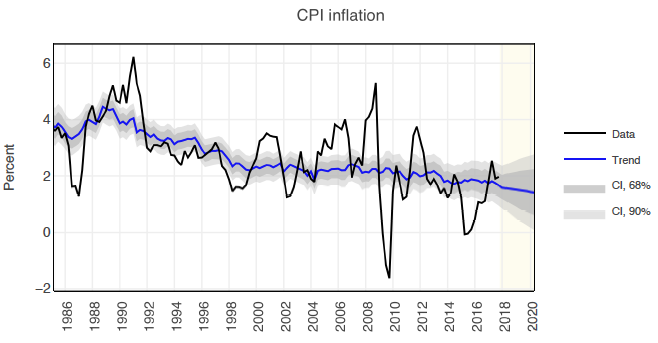 Trend inflation in the US appears to have been slowly drifting downwards historically, quite stable from 2000 until 2010, and slightly declining since. In the Eurozone, we can detect an historical slow decline due to preparation for entry into the currency union and, in recent times, a shift downwards in 2012, about one year after the two interest rates cuts implemented by the ECB and therefore possibly related to them. Inflation then stabilised at a lower level from 2016. Notes: Quarterly year-on-year CPI and trend. Forecast period is indicated with a shaded area, and goes from Q4-2017 to Q1-2020. Note: Quarterly year-on-year HICP and trend. Forecast period is indicated with a shaded area, and goes from Q4-2017 to Q1-2020. HICP prior 1998 is reconstructed using Area Wide Model (AWM) data. Source: Authors’ calculations, AWM, ECB. Figures 3 and 4 show the stationary components of inflation as they are understood by our model for the Eurozone and the US: the Phillips curve (blue area), an `oil price cycle' (red area), and an idiosyncratic stationary component uncorrelated to real variables and oil prices (yellow area). Results show that, in both economies, both oil prices and real activity matter in explaining temporary fluctuations of inflation and that the two cycles have different characteristics in terms of volatility and persistence. The Phillips curve – understood in modern Macroeconomic theory as a relationship connecting real variables, nominal variables, and inflation expectations – is well identified and has been fairly stable since the early 1980s. However, it is not always the dominant component. Large oil price fluctuations can move consumers' expectations away from the real-nominal relationship (‘disanchor' them) and induce expectation-driven fluctuations in prices. This result confirms the intuition of Coibion and Gorodnichenko (2015) for the US in a methodology which, in contrast to their approach, allows us to recover the Phillips curve as orthogonal to oil-driven movements in expectations and prices. Note: Quarterly year-on-year CPI cycle. Forecast period is indicated with a shaded area, and goes from Q4-2017 to Q1-2020. Note: Quarterly year-on-year HICP cycle. Forecast period is indicated with a shaded area, and goes from Q4-2017 to Q1-2020. HICP prior 1998 is reconstructed using Area Wide Model (AWM) data. We will now use the model to forecast the next two years and focus on the Eurozone. In Figure 5, we report results and compare them with official forecasts. Note: Quarterly year-on-year HICP. Forecast period is indicated with a shaded area, and goes from Q4-2017 to Q1-2020. HICP prior 1998 is reconstructed using Area Wide Model (AWM) data. Source: Authors’ calculations, AWM, Bloomberg, ECB. In 2018, our model forecasts an inflation rate of 1.5%, compared to the ECB prediction of 1.3%. For 2019, the model predicts that price growth will cool down to 1.1%, falling short of the the ECB forecast of an inflation rate of 1.6%, and the median forecast of the ECB survey of Professional Forecasters at 1.6%. The model’s projection is in line with the forecast implied by (bond market) breakeven inflation for Italy and France and exceeds breakeven for Germany. 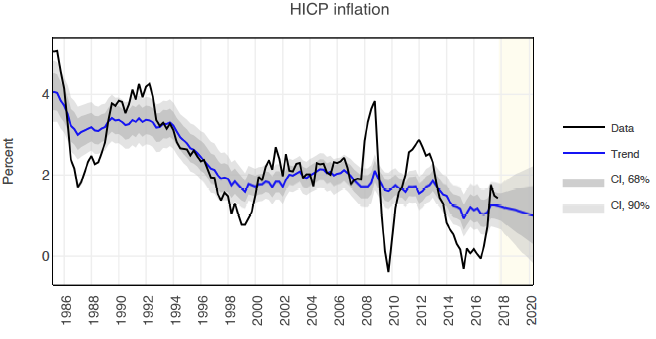 Considering uncertainty, the model tells us that the probability inflation will be below 1.6% in 2019 is 68%. The forecasts can be easily interpreted, with our structural decomposition in mind. The model does not expect trend expectations to pick up. This is of course in part the consequence of the fact that trend inflation is modelled as a random walk with constant drift; it could change in relation to future policy moves. Real economic conditions also do not appear to have enough momentum to exercise upward pressure. In fact, our model detects the cycle to have reached a peak and therefore forecasts a slowdown of real economic conditions which will bring us back to trend by 2019 (see Figure 6). Note: Quarterly output gap is calculated as the ratio between GDP cycle and trend. Forecast period is indicated with a shaded area, and goes from Q4-2017 to Q1-2020. GDP prior 1995 is reconstructed using Area Wide Model (AWM) data. The output gap estimated by our model implies a recession by the second part of 2019, and the economy reaching a peak in Q1 2018. The in-sample results are consistent with Bloomberg's estimate of the output gap (BCMPOGEA Index), following it closely since 1985. Overall, the probability of the output gap becoming negative by the end of 2019 is estimated at 57%. The forecast of different components of inflation in the Eurozone points to a high probability of inflation remaining below 1.6% in 2019. This prediction is based on the assessment that trend expectations will remain at the level of the last ten years, that oil price pressures will remain subdued, and that the economy will start slowing down in the second part of 2018 and possibly be in recession by the second part in 2019. Coibion, O and Y Gorodnichenko (2015), “Is the Phillips Curve Alive and Well after All? Inflation Expectations and the Missing Disinflation”, American Economic Journal: Macroeconomics 7(1): 197-232. 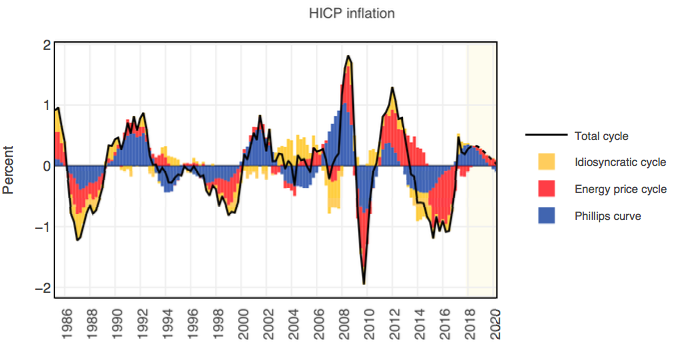 Hasenzagl, T, F Pellegrino, L Reichlin, and G Ricco (2018), “A Model of the Fed’s View on Inflation”, CEPR Discussion Paper No. 12564. Yellen, J L (2016), “Macroeconomic research after the crisis”, speech at "The Elusive ‘Great’ Recovery: Causes and Implications for Future Business Cycle Dynamics", 60th Annual Economic Conference, sponsored by the Federal Reserve Bank of Boston. As of 8 January, the oil price is around US$62/bbl. Crude oil future contracts for December 2018 are selling for $59/bbl and oil future contracts for December 2019 are selling for around $56/bbl, which implies that investors are currently expecting a fall in the oil price over the next two years. Assistant Professor of Economics, Warwick University; Chercheur Associé, OFCE-SciencesPo.